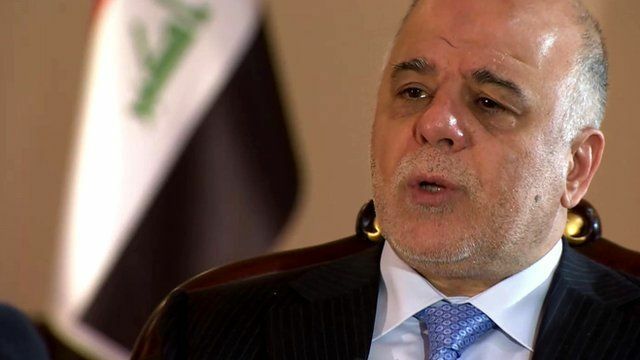 Iraq plans to regain Mosul - PM Jump to media player Iraqi Prime Minister Haider al-Abadi has told the BBC's John Simpson that Iraq is making preparations to move against the Islamic State stronghold of Mosul. Fear of airstrikes to retake Mosul Jump to media player The BBC's Paul Wood reports from a Kurdish checkpoint at Kalak which people are passing through as they flee Mosul. 'Normal' life continues in Mosul Jump to media player Jim Muir visits the outskirts of Mosul to find out how people have been coping since it fell to ISIS fighters. Iraqi Prime Minister Haider al-Abadi has told the BBC's John Simpson that Iraq is making preparations to move against the Islamic State stronghold of Mosul. He also said that when he took office five months ago, he was surprised at the lack of support from the US. However, he said that has changed significantly in the last four weeks with ''an acceleration of support''.